Control Systems Design Guide has helped thousands of engineers to improve machine performance. This fourth edition of the practical guide has been updated with cutting-edge control design scenarios, models and simulations enabling apps from battlebots to solar collectors. This useful reference enhances coverage of practical applications via the inclusion of new control system models, troubleshooting tips, and expanded coverage of complex systems requirements, such as increased speed, precision and remote capabilities, bridging the gap between the complex, math-heavy control theory taught in formal courses, and the efficient implementation required in real industry settings. George Ellis is Director of Technology Planning and Chief Engineer of Servo Systems at Kollmorgen Corporation, a leading provider of motion systems and components for original equipment manufacturers (OEMs) around the globe. He has designed an applied motion control systems professionally for over 30 years He has written two well-respected books with Academic Press, Observers in Control Systems and Control System Design Guide, now in its fourth edition. He has contributed articles on the application of controls to numerous magazines, including Machine Design, Control Engineering, Motion Systems Design, Power Control and Intelligent Motion, and Electronic Design News. Mechanical, electrical and industrial design engineers, and students preparing to enter these disciplines. 11.1 What is a Model? George Ellis is Vice President European Engineering at Kollmorgen Corporation, a leading provider of precision motion systems around the globe. For 30 years he has worked in product development including leading product development projects, designing development processes, and creating portfolio management systems. 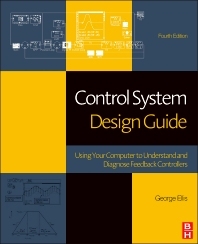 He has also written two well-respected books with Elsevier, Control System Design Guide, now in its fourth edition, and Observers in Control Systems. He has contributed articles to numerous magazines, including Electronic Design News, Machine Design, Control Engineering, Motion Systems Design, and Power Control and Intelligent Motion.